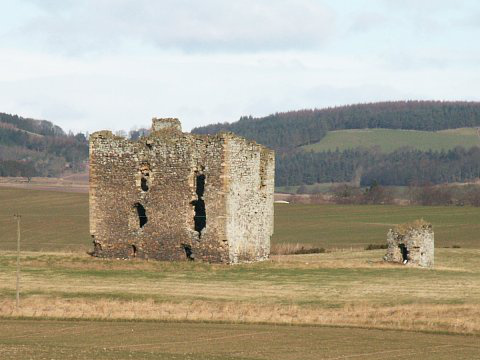 Notes: Lordscairnie Castle is a ruin situated near Moonzie, 2.5 miles (4.0 km) north-east of Cupar, Fife, Scotland. The castle was constructed in around 1495 by Alexander Lindsay, 7th Earl of Crawford (d.1517). It was originally an L-plan tower house with five storeys. It is owned by the Blackburn family who also own Fernie Castle in Fife. According to John Knox, James V of Scotland visited the castle just before his death in 1542. As of February 2013 the castle is for sale, at the price of 220,000. The sales particulars mention that the castle is a Category B Listed Building, but not that it is a monument scheduled under the terms of the Ancient Monuments and Archaeological Areas Act 1979.